The open breezeway of the Dutcher Crossing Winery links the tasting and barrel rooms and frames panoramic vineyard and distant hillside views of the Dry Creek Valley in northern Sonoma County. 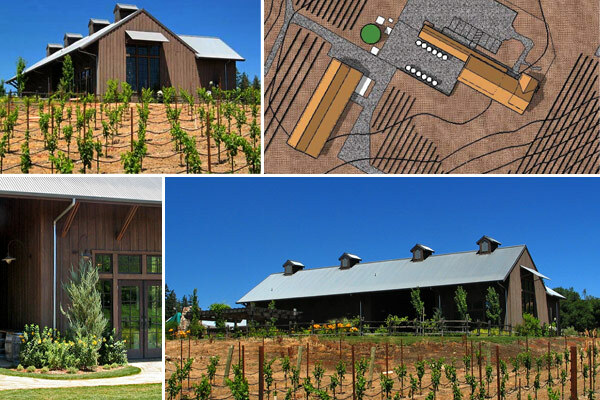 TFA’s design and choice of materials strive to compliment the scenic wine country beauty of the site. The board and batten siding and metal roofs of the exterior recall the traditional rural barn architecture of the region. The breezeway provides access to both the tasting room and retail sales area as well as a picnic courtyard with an outdoor fireplace. This courtyard features a vine covered arbor over picnic tables. This new winery facility also includes a work room, wine lab, office and exterior crush pad. The winery was included in a 2007 San Francisco Chronicle article on Sonoma County wineries entitled “Sonoma’s laid-back look”.